Puerto Iguazu is a tourist destination in the Northeast of Argentina towards the Triborder with Paraguay and Brazil with the Iguazu Falls in the vicinity which are the most amazing falls in the world. It is surrounded by subtropical vegetation which is part of the Iguazu National Park. The Iguazu National Park was established in 1934 by the national government and the town was then renamed Puerto Iguazu in 1943. This site has been listed as World Heritage site by UNESCO which is made up of 275 falls reaching up to a height of 70 meters that are scattered in a semi-circular shape, providing an amazing spectacle with its natural scenery, where the traces of ancient Jesuit missions are still appreciated. This waterfall can be explored on foot since there are easy accessible circuits with footbridges meant for such purposes. Crossing stairs, bridges and trails together with the vegetation around, provides the most awesome views which can be enjoyed from the lower ground as well as from the heights where one can reach the highest point of exhilaration at `The Devil’s Throat’. Though the visitors tend to get a bit wet at a point at that spot, it is worthwhile exploring this place to witness the beauty of the waters with their fall. Its 80 metres high cliff has one of the most spectacular falls together with the rainbow formation which portrays an amazing view. Besides the Devil’s Throat, Bosetti, Two Sisters, San Martin, Tres Mosqueteros Adam and Eve and Rivadavia are the other best known falls and during nights at the time of full moon, there are special tours that are conducted to have glimpses of the rainbow formed in the moonlight. With the high temperature together with the moisture in the environment, this area is turned into a large greenhouse which provides the appropriate condition to accommodate above 400 bird species, with 2,000 vegetable species together with a large diversity of orchids, ferns along with typical type of pala rosa. Numerous insects like the outstanding colourful and large butterflies are also found here which forms this park into one of the richest biomass on the planet earth. Several endangered species like the jaguar, alligators, monkey, snakes, tapirs as well as the funny coatis also tend to approach the tourist for some fruits. Its economy is based on tourism and with the several hotels in the city, the principal source of jobs has been provided for the inhabitants with several international hotels being constructed all along the banks of the Iguazu River. 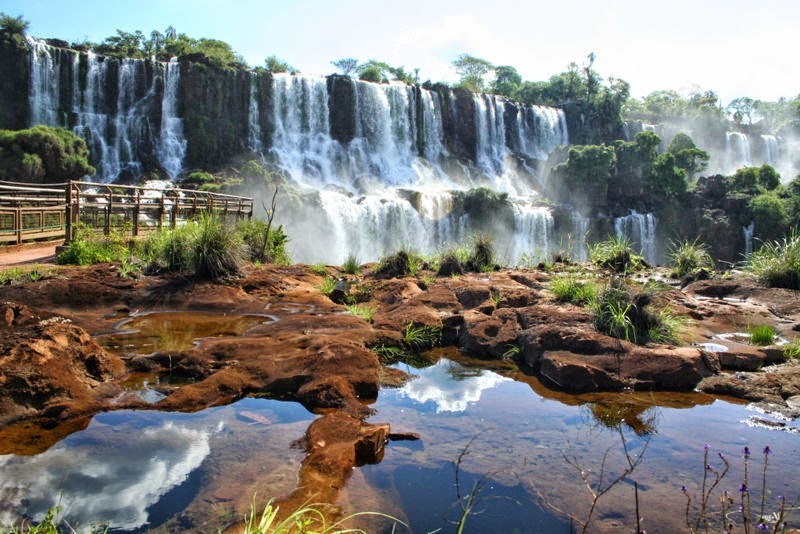 Other attractions include Three Frontiers wherein Argentine, Brazilian and Paraguayan borders meet. It is also a home to a community of active artisans, the La Aripuca resort, the Museum of Images of the Jungle – a collection of woodvarvings, the Mborore Museum, the Guira Oga Centre for Bird Rehabilitation, the Luis Honorio Rolon Municipal Nature Park, the Hotel Esturion, the Lguazu Grand Hotel and Casino to name a few. The Wanda Mines in the nearby area also draws gemstone and geode collectors whereby the mines are the site of some of Argentina’s best agate, quartz, amethyst and topaz lodes which have been operative since 1950s.